The present study aimed to investigate the effect of powdered nitrile rubber (NBR) content on the morphology, rheological behavior, anaerobic and thermal degradation, and life expectancy of blends based on polylactide (PLA) and poly(butylene adipate-co-terephthalate) (PBAT). The blends were prepared by extrusion and compression molding using a commercial PLA/PBAT (70:30 wt%) blend and powdered NBR coated with calcium carbonate (93:7 wt%). Photomicrographs from scanning electron microscopy revealed that the NBR particles, stained with osmium tetroxide, were preferentially located in the PLA matrix. Additionally, NBR contributed to reducing the size of PBAT domains. 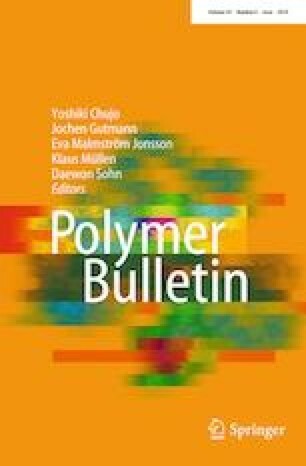 The rheological behavior of PLA/PBAT/NBR blends was dependent on rubber content, indicating that NBR plays an important role in blend flowability. Furthermore, a decline was observed in the activation energy needed to degrade 5% of the PLA contained in the blend, reducing the lifespan of NBR-based blends. This behavior was attributed to the thermal conductivity of the calcium carbonate present in the NBR. Finally, anaerobic degradation was not inhibited in the PLA/PBAT/NBR blend containing 20 wt% of rubber, although its biochemical methane potential was lower than that of PLA/PBAT/NBR. We would like to thank Basf and Nitriflex for donating polymers; the Center for Mineral Technology (CETEM) for the SEM analysis; and the Coordination for the Improvement of Higher Education Personnel (CAPES) for the grants.